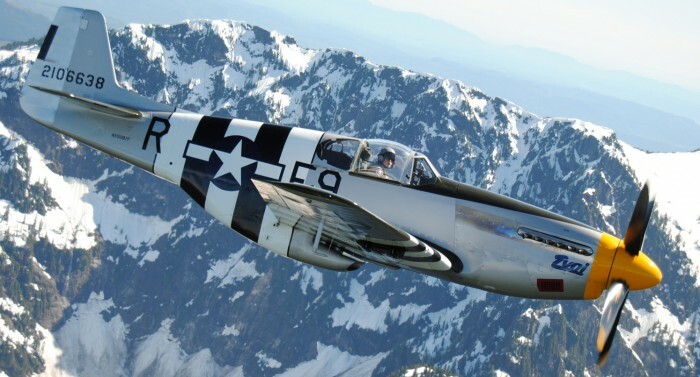 This North American Aviation P-51B Mustang is owned by John T. Sessions and is part of his Historic Flight Foundation collection based at Paine Field in Everett, Washington. This photo was taken onboard a B-25 Mitchell Bomber, the landscape in the background is Mt. Pilchuck near Everett, Washington. John T. Sessions is at the controls of the Mustang. Taken by Mitchell D. Babarovich. Your photo could be featured here, too! Just use our submit form to send your stories and photos!